The St Sofia Church, also called the Hagia Sophia Church, is the oldest Eastern Orthodox church in the city, dating from the 4th to 6th century, and is regarded as one of the most significant examples of early Christian architecture in the Balkans. 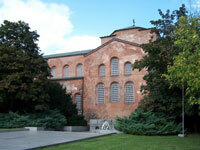 In the 14th century the church gave its name to the city of Sofia, meaning 'holy wisdom'. The church was built on the site of several earlier churches and places of worship, dating back to the days when the site was part of the necropolis of the Roman town of Serdica. As a result, several tombs have been discovered under and around the church which are incredibly interesting for history buffs. During the Turkish rule the church was converted into a mosque, but was abandoned after two successive earthquakes destroyed one of the minarets almost 30 years later, and it was again converted into an orthodox church. Local legends credit St Sofia's miraculous powers for its protection over the centuries, surviving occupations and natural disasters to remain a spiritual inspiration to the city. Address: ul. Paris 2, 1000 Sofia, Bulgaria.